Matt Damon returns as the trained assassin Jason Bourne for the latest showdown in The Bourne Ultimatum. In the follow-up to 2002's The Bourne Identity and The Bourne Supremacy - the smash hits that have earned over $500 million at the global box office - acclaimed director Paul Greengrass joins returning cast members Julia Stiles and Joan Allen and new additions David Strathairn, Scott Glenn, Paddy Considine, Edgar Ramirez and Albert Finney. $69.283 million on 3660 screens. Back when we learned that Matt Damon would appear in Robert Ludlum’s The Bourne Identity, many folks snickered. The concept of Damon as action hero seemed far-fetched, so the film’s prospects didn’t appear promising. Two films later, no one’s laughing anymore. 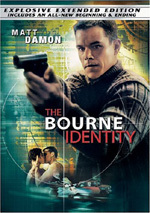 Identity earned a pretty good $121 million, a figure strong enough to greenlight 2004’s The Bourne Supremacy. That movie went on to improve on its predecessor’s take with a US gross of $176 million. Of course, the increasing financial success of the series led to a third chapter, 2007’s The Bourne Ultimatum, and even more money. Ultimatum proved to be the biggest hit of the bunch with its $227 million gross. I think Ultimatum was planned to be the last Bourne flick, but given the financial trend we see here, don’t be surprised if a fourth effort hits screens around 2010. 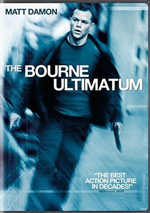 Ultimatum essentially picks up on the same story pursued in the first two flicks, as super-skilled operative/assassin Jason Bourne (Damon) tries to learn the secrets of his mysterious past – and take revenge on those who messed him up along the way. The folks at the CIA who trained him don’t want this to happen, so they and other hush-hush organizations attempt to impede his progress. And there’s your story! After the first flick, the two subsequent Bourne adventures haven’t exactly been heavy on plot, and even Identity dealt more with back story rather than actual narrative. I think Ultimatum suffers from the absence of an actual story, as it starts to feel like a really, really long episode of The Fugitive. This will probably fall in the “beating a dead horse” category, as I and others have often moaned about director Paul Greengrass’s love for jittery hand-held camera work. This isn’t merely a stylistic gripe; it’s a physical complaint, for on the big screen, this material can cause motion sickness. That’s why I’ll never see another Greengrass flick anywhere other than in my home theater; after the headaches and nausea of Supremacy and United 93, I cried “uncle” and conceded defeat. But Greengrass’s photography doesn’t bother me when rendered smaller, so my stomach can handle these flicks at home. Even without the nausea, however, I find myself dissatisfied with the shakycam. I’m not a fan of lots of handheld work period, as I think the “documentary style” is often just a cheap storytelling device. Directors not clever enough to bring immediacy to their work use handheld shots to create that fake “realism” ala a documentary. As I watched Ultimatum, I just wanted to scream “enough already!” The technique works acceptably well during the more active sequences, but it serves as nothing more than an annoyance and a distraction most of the time. The lack of restraint is the main issue. Since Greengrass plays the whole film at full tilt, it has nowhere to go. Which means the action scenes lose the needed sense of urgency. Too much of Ultimatum plays like a climax, so the audience gets no time to rest and the big action pieces become just part of the scenery. The constant emphasis on urgency and movement ironically robs the flick of those feelings. The scenes that should involve us just feel like part of the scenery. I really want to like these Bourne films, and I go into each one with high hopes, but after the satisfying Identity, they never live up to expectations. In the hands of director Paul Greengrass, they exhibit lots of sturm und drang with little actual tension or excitement. If there’s a fourth Bourne effort, I hope someone else directs it, as otherwise I expect more of the same, and that doesn’t appeal to me at all. 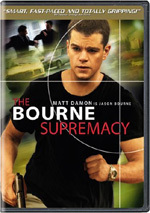 The Bourne Ultimatum appears in an aspect ratio of approximately 2.40:1 on this single-sided, double-layered DVD; the image has been enhanced for 16X9 televisions. No problems emerged in this solid transfer. Sharpness remained positive. At all times, the flick came across as concise and well-defined. I witnessed no signs of jagged edges or shimmering, and edge enhancement seemed to be absent. Source flaws also failed to materialize, as the film always seemed clean. Ultimatum went with a low-key palette. The movie rarely favored bright tones, as it stayed subdued and stylized. Within those constraints, the colors seemed accurate. This wasn’t a Technicolor extravaganza but I found no fault with the hues as designed. Blacks also seemed more than acceptable, and low-light shots showed good definition. Overall, this was a very good transfer. Similar thoughts greeted the good Dolby Digital 5.1 soundtrack of Ultimatum. The soundfield took advantage of its opportunities to shine. The action sequences especially opened up the mix to a broad and satisfying degree. They used the surrounds well and formed a fine sense of activity. Quieter sequences created a nice feeling of ambience, and music offered nice stereo imaging. Audio quality was solid. Speech always sounded natural and concise, and I noticed no signs of edginess or other problems. Music was bright and dynamic, and effects worked well. Those elements seemed clean and accurate, and they presented very nice bass response. This was a fine track that merited a “B+“. As we move to the extras, we start with an audio commentary from director Paul Greengrass. He provides a running, screen-specific chat. Greengrass examines the film’s tempo, story and script choices, locations, stunts and action, cast and performances, editing, inspirations, and the challenges of working in a trilogy. While Greengrass provides a competent commentary, he never makes the chat better than average. The piece always feels rather dry, and Greengrass often does little more than simply narrate the flick. A mix of decent insights does emerge along the way, so the commentary remains listenable at all times. It just never turns into anything more involving than that. Eight Deleted Scenes run a total of 12 minutes, 22 seconds. The longest – and best – offers more exploration of the workings at the CIA. I assume it got cut because it was too expository, but I think the film could’ve used it, as it would’ve better expanded the story. We also get a little more narrative with Ross and his source, though that piece doesn’t really add anything. Some of the others bring in additional exposition that may’ve been productive. Other than the opening CIA piece, none of them seem great, but some useful material does emerge here. Five featurettes follow. Man on the Movie: Jason Bourne lasts 23 minutes, 56 seconds as it mixes movie clips, shots from the set, and comments from Greengrass, producers Frank Marshall, Paul Sandberg and Patrick Crowley, Berlin location manager Marcus Bensch, SnowBusiness’s Lucian Stevenson, stuntman Adam Kirley, 2nd unit director Adam Grayson, visual effects supervisor Charlie Noble, camera operator Klemens Becker, still photographer Jason Boland, UK location manager Sam Breckman, 2nd ADs Tom Brewster and Michael Stevenson, security guard Terry Rigarlsfoid, digital playback Gavin McKenzie, sound mixer Kirk Francis, Morocco location manager Jafar, Morocco line producer Zakaria Alaoui, Morocco unit manager Omar Chraibi, supervising art director Alan Gilmore, Moroccan guide Simo, and actors Matt Damon, Julia Stiles, Paddy Considine, Joey Ansah, Edgar Ramirez, Scott Atkin and Chucky Venice. “Move” looks at some of the movie’s locations and issues related to their set-up and use. We get an unusually interesting glimpse of set issues here, as we learn about logistical complications and subjects like fake snow and shooting in Morocco during Ramadan. Add to that a lot of nice shots from the sets and this becomes a quality piece. Next comes the five-minute and 39-second Rooftop Pursuit. It includes remarks from Damon, Greengrass, 2nd unit camera operator Peter Wignall, 2nd unit director Dan Bradley, special effects wire supervisor Jason Leinster, 2nd unit Libra technician Joe Buxton, stunt double David Leitch, stunt coordinator Gary Powell, special effects technician Hayley Williams, and stuntman/JumpCam operator Diz Sharpe. The piece looks at stunts and camera issues involved with the Moroccan chase sequence. Short but sweet, “Pursuit” offers a good glimpse of the complications involved in this scene. For the four-minute and 59-second Planning the Punches, we hear from Ansah, Damon, fight stunt coordinator Jeff Imada, and breakaway and safety props Thomas Jones. This one looks at the planning and execution of the fight scene between Bourne and Desh. The behind the scenes footage proves especially interesting, as those elements help make this another useful program. Driving School fills three minutes, 23 seconds with info from Bradley and Damon. We see Damon’s training for the New York car sequence. The featurette lacks much substance, but it’s fun to see the actor take his spins on the test track. New York Chase goes for 10 minutes, 46 seconds and features Damon, Bradley, picture vehicle supervisor Graham Kelly, stunt coordinator-second unit Darrin Prescott and stuntmen Scott Rogers and Kevin Scott. “Chase” shows the filming of the sequence for which Damon trained in the prior featurette. Once again, the footage from the shoot proves the most valuable, as we get some great glimpses of the production issues. The DVD opens with some ads. We find promos for The Kingdom, American Pie Presents Beta House, Bring It On: In It to Win It, HD-DVD and a videogame for The Bourne Conspiracy. No trailer for Ultimatum appears here. Since The Bourne Ultimatum received good reviews and made lots of money, I’m in the minority, but I don’t find much here to enjoy. The director’s excessive emphasis on shaky camerawork and a relentless pace, the action loses power and actually becomes tedious. Add to that a near absence of story and the movie just plods along without much to truly involve the audience. The DVD provides very good picture and audio along with a collection of generally useful extras. I find a lot to like in terms of this DVD release but can’t endorse the movie itself.